Difference between revisions of "Muse2ps"
The ''muse2ps'' program executables for various operating systems or the source code can be downloaded from the following table. Instructions for setting up the program for use can be found ''[[Muse2ps_installation_instructions| here]]''. 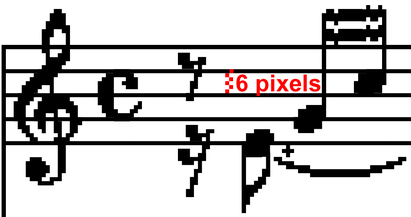 When a MuseData stage2 file is converted into graphical music notation as PostScript output from muse2ps, it will pass through two data transformation steps. The first step is a conversion from stage2 data into non-page-specific i-files which is accomplished with the autoset component. Then these "non-page-specific" i-files are converted into "page-specific" i-files (or Music Page (MPG) files) which describe the precise position of musical elements on each page of typeset music. This music page data can be captured surreptitiously by using the "=P" option. This will cause the MPG data to be embedded in comments within the PostScript output. Each page of MPG data will be stored in a sequence of comments starting with "%=BeginMPGData: 1", where 1 is the data for page one. And each page of MPG data is ended by the comment "%=EndMPGData: 1". If you are inputting multiple MPG files (each MPG file represents one page of a score or part), add the letter "P" on a line by itself after the single-page MPG content.